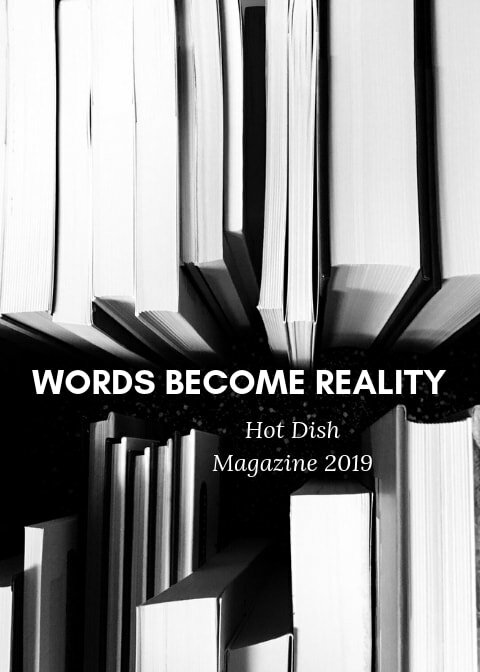 This year marks the third issue of Hot Dish Magazine, and we’re as excited as ever to see so many submissions from both new and returning authors. Our focus this year has been on working closely with our authors to improve their works before publication, exploring new ways to phrase their ideas and to tease out the messages they want to convey. We may have accepted fewer submissions this year than in previous issues, but by working closely with our authors we were able to bring out the best possible versions of their pieces. Thank you so much to everyone who submitted and cooperated with us in the editing process! We hope to hear from you again next year. Our Hot Dish Challenge this year revolved around making creative use of a set of words we provided (exhaust, blade, rusty, shuffle, brittle, shake, feather) in any creative writing style. Many of our submissions made creative use of these words, but our category winner “Someone Who Always Pays,” written by Collette Grace, impressed us with its strong, well-written dialogue and well-developed characters. Our poetry submissions this year impressed us with their wide variety, from formal forms like sestinas and villanelles to experiments with shape and format, and on every topic from strong emotional pieces to simple, positive odes to items, places, and moments. Our category winner was Greta Sents’s “The River and the Earth.” Originally submitted as two separate poems, the relation between the two and their unique formatting made them work well as a combined poem, and each impressed us with its dreamlike interpretation of these natural elements. Fantasy ran strong this year in our short fiction category, with both of our accepted submissions (“A Simple Story” and “The King’s Battle”) making good use of fantasy settings and tropes. In the end, we chose Ben Kockelman’s “A Simple Story” as our winner for its well-written dialogue, sense of place, and the way it played with the meta of its own story. While it was not selected as an award winner, Grant Lenz’s poetry piece “The Show Goes On” inspired our title, describing the breathtaking moment in which a theater production begins and a fictional story briefly becomes reality for its audience. We’d like to extend a thank you to everyone involved in the publication of this issue, from our courageous submitters to our tireless editors, and the instructors on both ends that push their students to achieve.